The SAT is a standardized test consisting of four sections (Reading, Writing and Language, No Calculator Math, and Calculator Math) as well as an optional essay. The test is scored out of 1600. A prep course with mindfish can help students raise their SAT scores by an average of 150 points, and many of our students have successfully raised their scores by even more. Although some some private high schools in the Boise area administer the ACT, public high schools in the Treasure Valley like Timberline, Boise High, and Borah administer a school-wide SAT in the spring. In 2018, the SAT will be administered to public high school students in Boise on April 10. Contact us for a consultation about which test would be best for your student or to schedule a practice test. At Mindfish we only work with official practice tests released by the College Board. It’s important to practice using the most realistic materials available and official practice tests provide that opportunity. 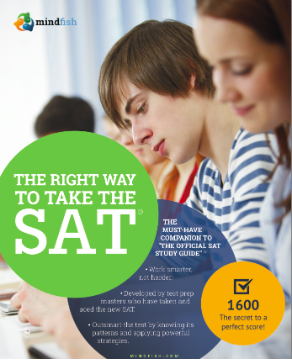 Every Mindfish SAT prep student receives copies of The Official SAT Study Guide and The Right Way to Take the SAT by Mindfish.